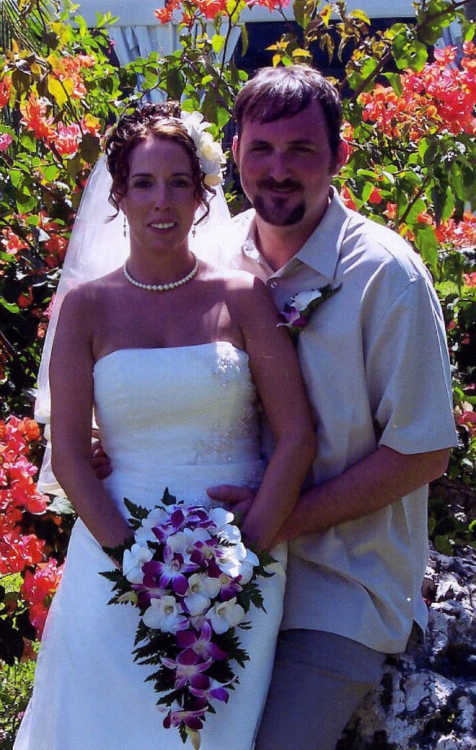 Rebecca Betterton, daughter of Mrs. Betty Wolsey, and Ryan Ramsey, son of Ken and Pat Ramsey, all of Joplin, Mo., were married on April 10, 2008, at the Sandals Grande Ocho Rios Resort in Montego Bay, Jamaica. Minister Sheldon Anderson performed the ceremony. Rebecca wore a long, strapless gown of ecru silk shantung and chiffon, with embellishments of sequins on the bodice, and sequins and appliqué of flowers on the skirt that flowed into a chapel length train. Her fingertip veil, made by the groom's mother, was fashioned of ecru bridal illusion trimmed with a satin fold-over edging. She carried a bouquet of lavender and white orchids. Ken and Pat Ramsey hosted a reception for the couple on Saturday, April 19, 2008, at the Webb City Mining Days Community Center. Guests enjoyed a deli luncheon from a buffet table reflecting a tropical theme. A grass skirt draped the serving table and was accentuated with seashells and tropical flowers. The four-tiered wedding cake, a creation of the groom's grandmother, Beverly Geiger, Uniontown, Kan., and mother, Pat Ramsey, featured a fountain, and was decorated with fresh tropical flowers and shells, and was topped with a nosegay of tropical flowers. Punch, mixed nuts, and cream cheese mints completed the table. The newlyweds are at home at 1927 Bluebird Drive, Webb City, Mo. Rebecca works in Human Resources at Freeman Health System, Joplin, Mo., and Ryan is a Team Leader for General Mills, Joplin, Mo. Grandparents of the groom are Dewaine and Beverly Geiger, and the late EImo and Mary Ramsey, all of Uniontown. Ken and Pat Ramsey are former residents of Fort Scott.